Group by keywords archive management bug - ACD Systems International Inc. This is an ancient bug I've reported since the first ACDSee Pro days, but I've yet to see any kind of fix for it. 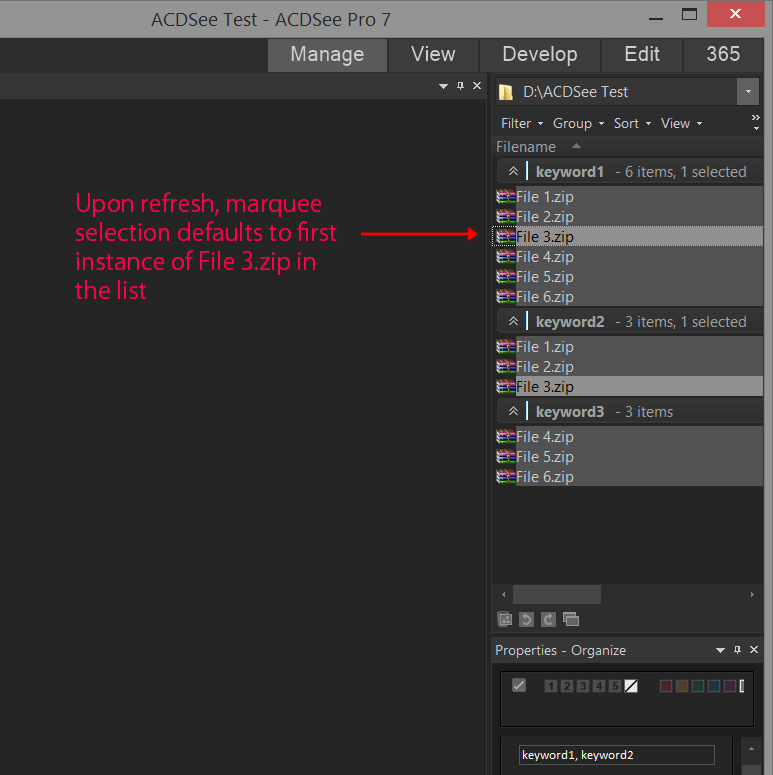 I'm not posting this in the ACDSee Pro forum because I've experienced it across the range of ACDSee products. When an archive file is tagged with two different keywords and the list of files is grouped by keywords, ACDSee will fail to open the archive with the error "No images were selected for viewing" because the same archive file is selected multiple times in the file list. In fact, simply selecting two different archives within the same ungrouped file list and pressing enter will trigger this error when it should just open the one in the group that is highlighted by the marquee selection cursor, which is always only on one file. When the same scenario happens with multiple image files, one image file in the selection is opened for viewing. This makes navigating archives by keyword very frustrating as to open the archive I have to turn off group by keywords, and turn it back on when I'm done with it. A related bug is when refreshing the file list with an archive with multiple keywords selected, the primary selection will default to the first instance of the archive in the filelist (in other words under the grouping of the first keyword it's tagged with) instead of the instance that was selected before. These seem like easy fixes, and if a plugin SDK or the code for the archive management plugin was available I would be happy to do it myself.